Now that the Nashville flood has started to get National Coverage on CNN I thought I would go ahead and let everyone know how the flood has impacted our family. I realize there are many wonderful people that read our blog whom I've never met and some of you may be concerned that we are okay. Thankfully I can report that our family is okay and made it out of the flood waters safe but unfortunately we lost our home in the flood. I have actually heard that the tragedy of the 2010 Nashville flood is the single largest disaster in TN since the Civil War. There are no words to explain the devastation I've witnessed in Nashville in the last 6 days. It is just heartbreaking. On Saturday the rain in Nashville was terrible. We have a creek in our backyard and we kept watching the water rise. We weren't concerned at first but towards lunch we started to get really worried. Brad decided we probably needed to pull our boat away from the creek and parked it on the side of our house. 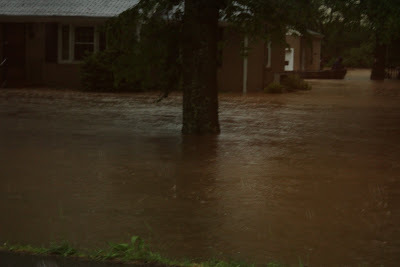 We kept watching the rain and the water rising but never in a million years thought our house would be underwater soon. Around 2:00 Brad said he thought it was time for us to possibly gather some things in case we needed to leave. He decided to drive our boat down the road to higher ground. 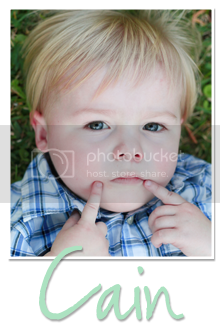 While he did this I frantically dressed Cain and gathered our most important belongings like Cain's heart meds. Just in the few minutes Brad was gone the water had reached our back door. Brad raced in and took Cain to get him out of the house as fast as he could. Brad put Cain in our car and drove him across the street. At this point I was in total shock and couldn't even think straight anymore. 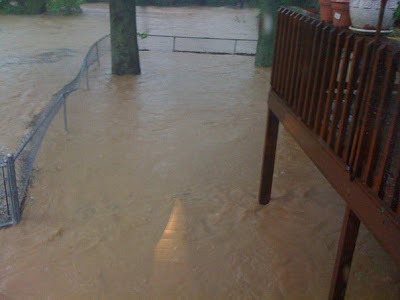 Our house was beginning to flood. Our really good friend Benson came to our front door to get me and walked me through our yard over to Cain. Literally in less than 5 minutes the water was over my knees/thighs. Benson had me hold on to him as we walked across the yard so the water wouldn't sweep me away. Plus I think he was afraid I'd run back to my house to try to save more belongings. 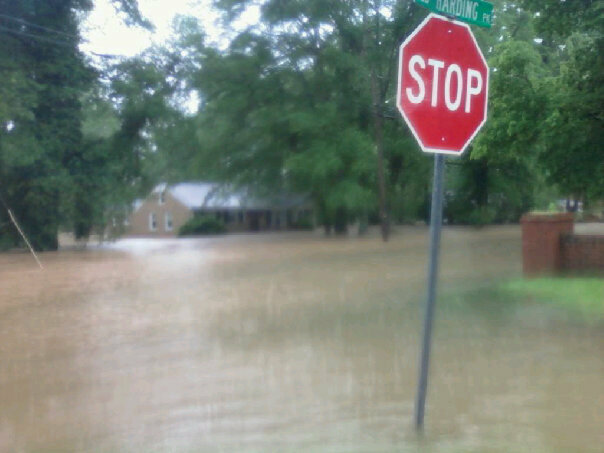 I don't think I'll ever be able to forget that walk away from my house knowing I was leaving but my house was flooding. I stood across the street and watched my house flood as Brad and Benson worked frantically trying to get irreplaceable items like family photos, wedding pictures, Cain's medical info, etc. into our attic. Our house as the water was rising. Thankfully we were able to move Brad's car before water got in it. Our neighbor Johnny using his boat to get things out of his house and safely to the road. After about an hour the water started to recede a little. My neighbor offered to watch Cain as I went back in the house to access the damage and help Brad & Benson gather us some clothes and important items. I thought that was the worst of the flooding but unfortunately that wasn't the case. Knowing that we would be out of our home for awhile we found an Extended Stay hotel to stay in Saturday night. On Sunday morning around 7:oo we received a call from the neighbor across informing us that our house was about to flood again for the 3rd time. We found out it had flood again around 12:30 that night. 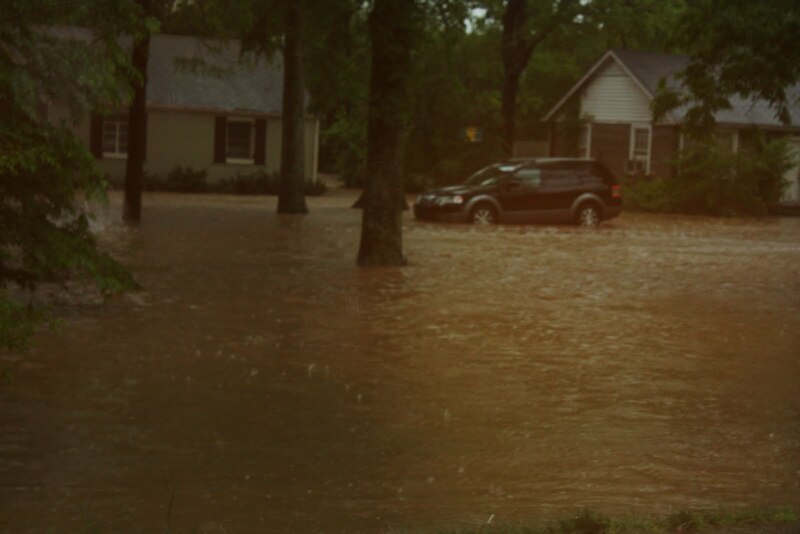 We couldn't get home until the water receded but some of the neighbors took a few pictures of what the neighborhood looked like at its worst. 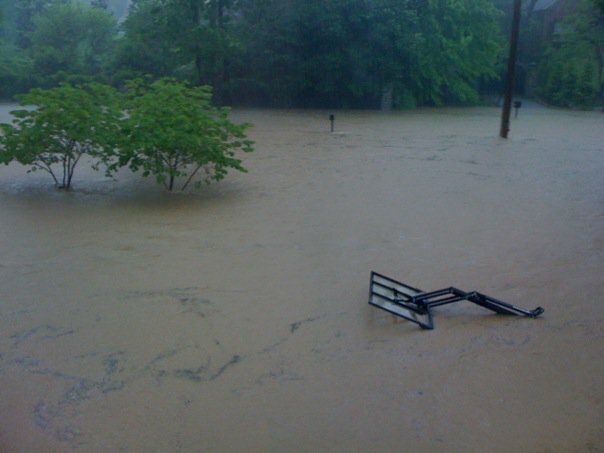 This picture was taken by a neighbor that lives a house down the road from us. His house sits up much higher with an unfinished basement. This was the picture he took looking out the front of his house to our road. And a few out of his back door. 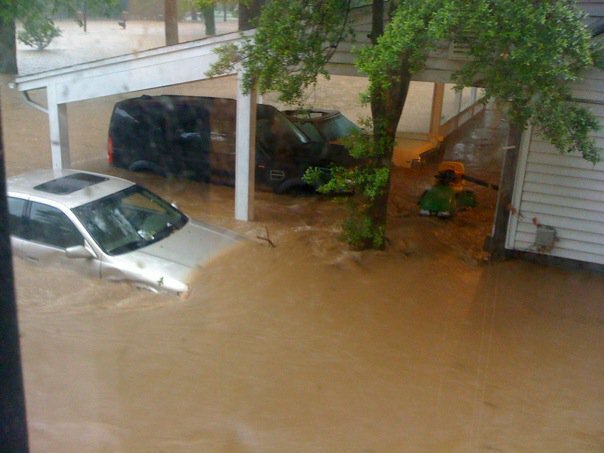 My next door neighbor's cars under water. I was trying to upload pictures from after the flood but it is taking way too long. 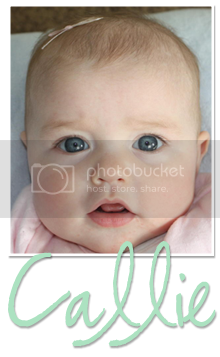 I'll try again tonight or tomorrow but for now I need to get over to our house to work. Brad has been cleaning out the house all week with the help of many WONDERFUL friends. I've been outside packing anything we could salvage into boxes. We have been told we will be out of our house for 3-6 months as the water damage is dried out, the house is treated for mold, and then it will need to be rebuilt. I know all of this seems very unfortunate (and it is) but we are truly blessed. Our house and belongings can be replaced...people cannot be replaced. There have been over 20 deaths in TN due to the flooding. We are one of the fortunate who has flood insurance. We have insurance that will help with our structural damage. We thought we had contents coverage but realized after the flood that we didn't and our lost contents (furniture, appliances, etc.) won't be covered. Again, we are still very fortunate because SO MANY people affected by this flood have no insurance at all. It has been a very tragic event for Nashville. One that is hard to even put into words. One thing I have learned though is I'm proud to be from Nashville. Everyone is pulling together to help their neighbor. I am SO sorry you lost your home! I am happy that you are all safe and that you were able to get some of your precious things out of there. Insurance is a great blessing! God will provide and things will work out, my prayers go out to all of the famlies of TN. I can't imagine!!! OH Catherine, I cried as I read this. Even though I had seen your FB posts and talked to you. I cannot imagine the thoughts and feelings of watching your house and belongings destroyed! But what a blessing that the 3 of you are safe. Many many prayers for your family. I'm so glad you were able to make it out ok. May the rebuilding process go smoothly. I'm sorry you had to deal with this, too. Glad you have insurance and a good attitude. Hope things go well for you and your neighbors. /sending more prayers your way. Wow. I'm so sorry this has affected you guys! What a horrible disaster...so glad you're handling it with grace and looking on the bright side. I'll keep you in my prayers. Again, I'm sorry. Hello my friend. I glad tohear from you and it seems clean-up is coming along. We are still in clean-up mode at the golf course but we hope to be up and running by the end of the week. I wish I could be there to help but please know you are in my thoughts and prayers. Know I always have a place for you to stay. We have had our babysitter staying with us since Wednesday and she will most likelt stay until mid-week. Nashville is a great community and grown so much this past week. I am so very sorry. The flood in Nashville is so sad. I have several friends there, some were lucky and had no flooding, others not so much. I am so sorry you guys were one of the ones that got flooded. I live in Atlanta, not to far and if you need anything, I will be glad to help. I am just glad like you said that all of you were able to get out safely. Hugs to you and your family.